I love Christmas. Everything about it — the music, the decorations, the schmoopy TV specials, the cold air, the fattening food, the crazy shopping experiences, and — most importantly — the time with family. Yet it is a very busy time, and always hard to get everything done, especially when deadlines loom. I finished my decorating over the past weekend, and have only a couple of gifts left to buy, and now I have to try to concentrate on work and other everyday responsibilities until my girls arrive from their separate coasts and my son will be home from college to spend the holidays with us. I put up two Christmas trees every year. One is filled to maximum capacity with the ornaments I’ve collected during our 32 years of marriage — I always pick up ornaments as souvenirs of my travels (though, as I’ve mentioned, most of my traveling is of the armchair variety), and the others all have a story that makes them special to me. 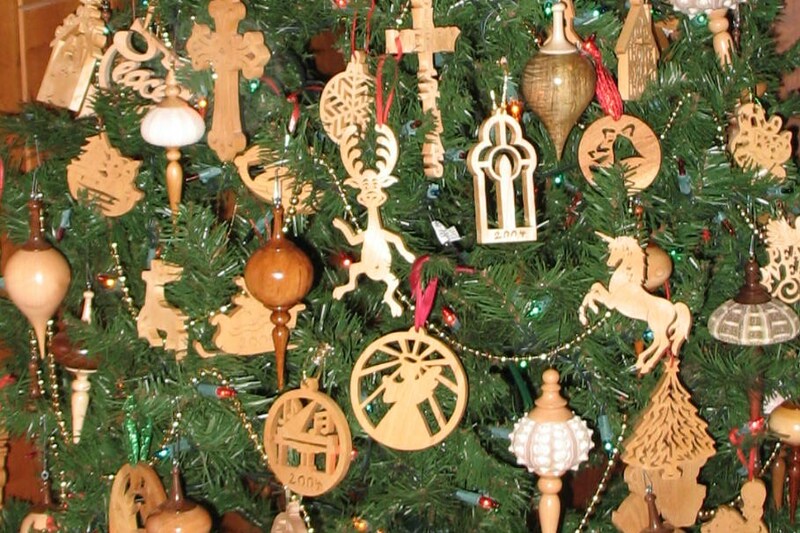 The other tree (pictured above) is filled completely with ornaments my husband has made for me either on his scroll saw or his wood lathe (the ones he prefers making). He sells the turned wood ornaments on his website and at the Historical Arkansas Museum Store, but I always sneak a few out of his inventory for myself. This year he made some using sea urchins with turned wood finials — very cool! He had to hide some of them from me so he’d have some left over to sell. I’ve had quite a few requests by email for autographed books to be given as Christmas presents this year. I’m always delighted to comply — it’s very flattering! — but I do have to ask that if you want any autographed books mailed to you before Christmas that you get your orders in soon. I have a few copies of most (but not all) of the titles on my backlist page. I ask $5 a copy for them, and $5 for priority mail postage for up to 2 titles, check, money order or PayPal. Send me an email at gina.w@live.com, preferably before Dec. 20, if you want one. The details for the new contest prize are up. In honor of the January 1 drawing date, I’m giving away a copy of A NIGHT TO REMEMBER, a New Year’s Eve themed book I wrote for Harlequin Temptation in 1997 — a collector’s book! Entering is super easy — just send your name and address to me by email and you’ll be entered in the drawing. One final note today: Don’t forget that A VERY NASCAR HOLIDAY is available in stores now, including my Christmas story, SECRET SANTA. Details are on the Books Available Now page. Click on the tab above. Previous Post December 1 Drawing Winner!